After spending a couple days in Lima, you'll travel to Puerto Maldonado to see some stunning wildlife and enjoy the Amazon jungle. Then onwards to Cusco to relax and prepare for the Inca Trail. 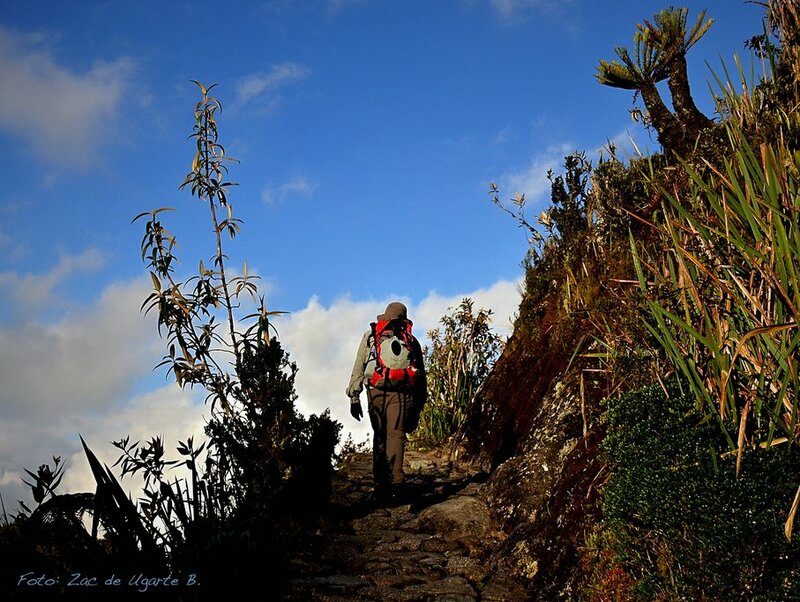 A classic 4-day trek in the Cordillera Urubamba, deep in the Andes mountains. 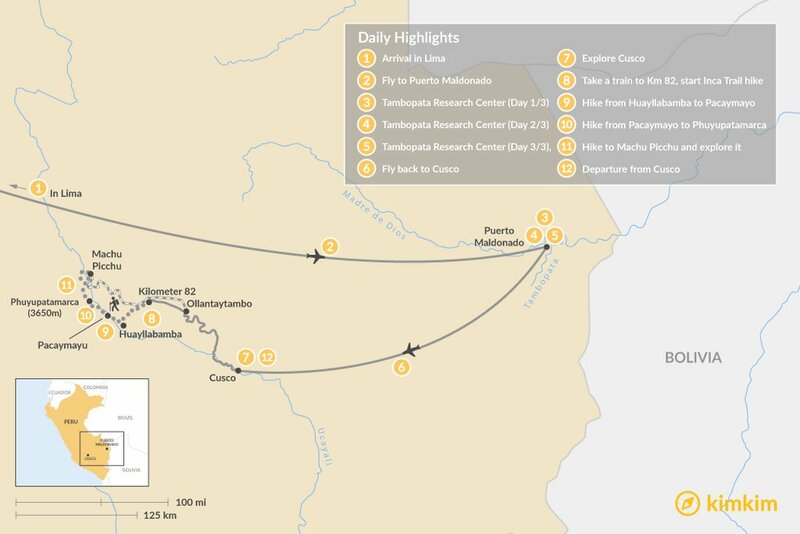 The culmination & finale of this trek will be reaching Machu Picchu. Welcome to Peru! Our representative will meet and greet you at Lima’s Jorge Chávez International airport. Once safely and comfortably checked in at your hotel in Miraflores, you are free to rest or take a look around the Miraflores district of Lima. Miraflores is geared up for tourists and locals alike. There are lots of things to do and discover depending on your preferences. 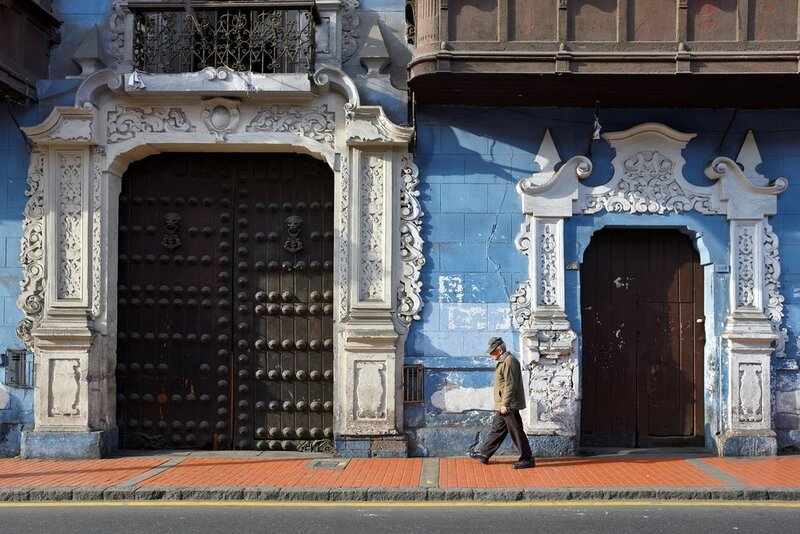 Avenida Larco with its shops and cafes leads you down towards Larco Mar. This is a popular destination for shopping, dining, cinema and 10-pin bowling. Overlooking the Pacific Ocean, you can relax and take in the views of the surfers and paragliders whilst having a cocktail or coffee break. Be mindful that tonight is all about resting to restore your energy for the unforgettable experience that awaits you, for tomorrow we head to the Amazon. In the morning, you'll be picked up from your hotel and taken to the airport for your flight to Puerto Maldonado. On arrival to Puerto Maldonado, you will be met by a representative from Rainforest Expeditions with a sign with your name on it. 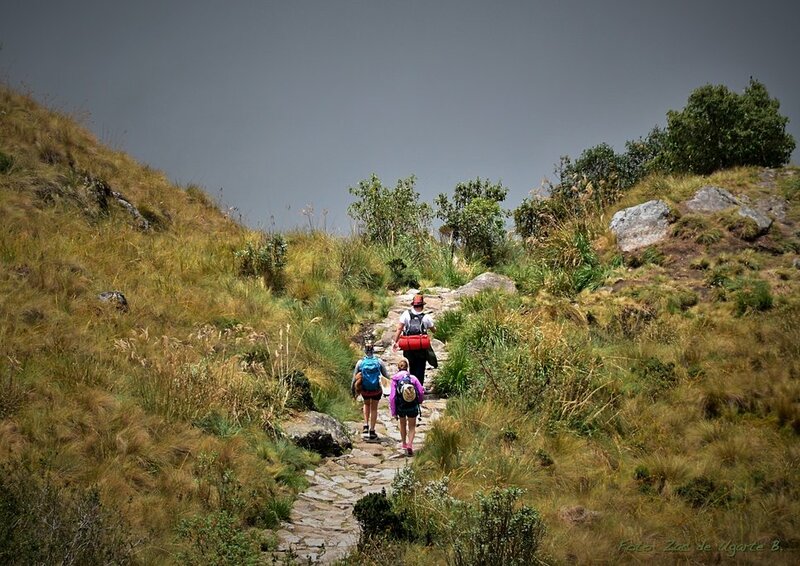 They will take you to their office in the city where you can leave any extra luggage that you don’t need to take to the lodge (like your trekking clothes for Machu Picchu and cold weather gear for Cusco, which we suggest you pack in a separate bag). 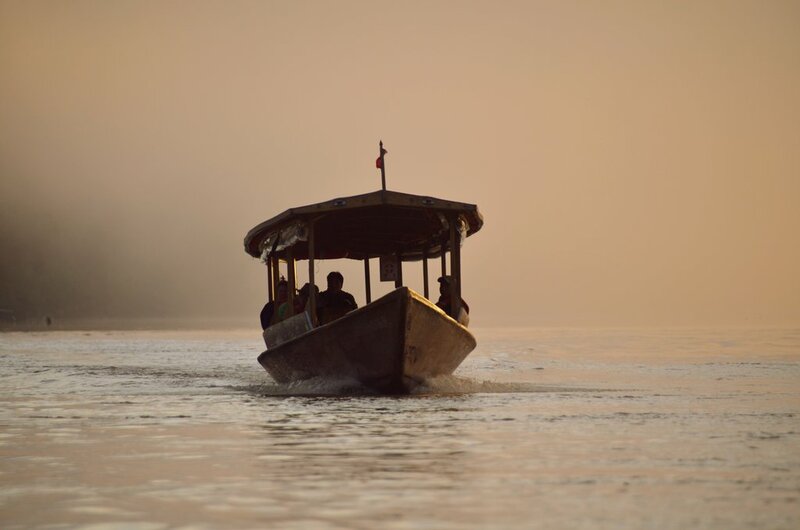 The two and a half hour boat ride from the Tambopata Port to Refugio Amazonas will take us past the Community of Infierno and the Tambopata National Reserve ́s checkpoint and into the buffer zone of this 1.3 million hectare conservation unit. Upon arrival, the lodge manager will welcome you and brief you with important navigation and security tips. You'll then overnight at Refugio Amazonas. A thirty-minute walk from Refugio Amazonas leads to the 25-meter scaffolding canopy tower. A banistered staircase running through the middle provides safe access to the platforms above. The tower has been built upon high ground, therefore increasing your horizon of the continuous primary forest extending out towards the Tambopata National Reserve. 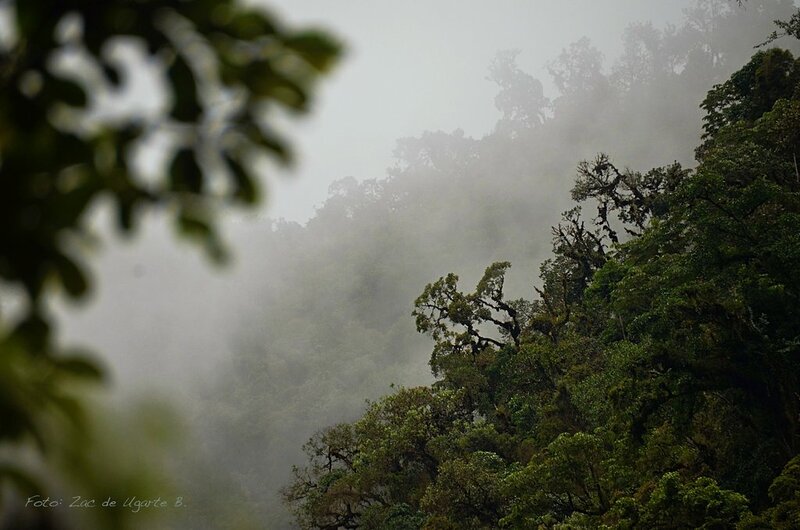 From here, views of mixed species canopy flocks as well as toucans, macaws, and raptors are likely. 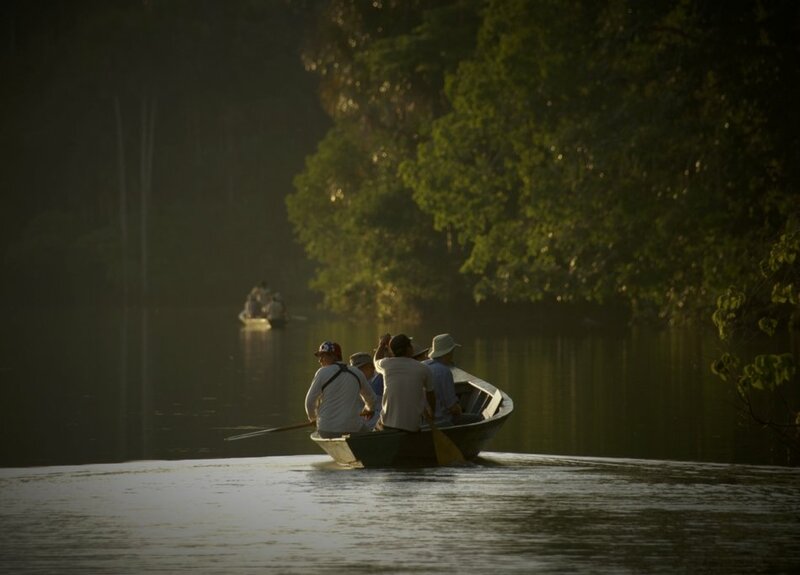 Four and half hours by boat from Refugio Amazonas, in the pristine heart of the reserve, lies the Tambopata Research Center. One and half hours into our boat journey, as we cross the confluence with the Malinowski River, we will leave the final traces of human habitation behind. Within the 700,000 hectares reserve, sightings of capybara, caiman, geese, macaws and other large species will become more frequent. Three hours from Refugio Amazonas, deep in the Tambopata National Reserve, we will stop at the Chuncho clay lick. After a brief walk (~5 minutes) we will have the chance to see dozens of large macaws feeding on the special sodium rich clays of the riverbank. The Chuncho clay lick probably attracts more large macaws than any other clay lick in the world and the sight of dozens of macaws taking flight is truly unforgettable. 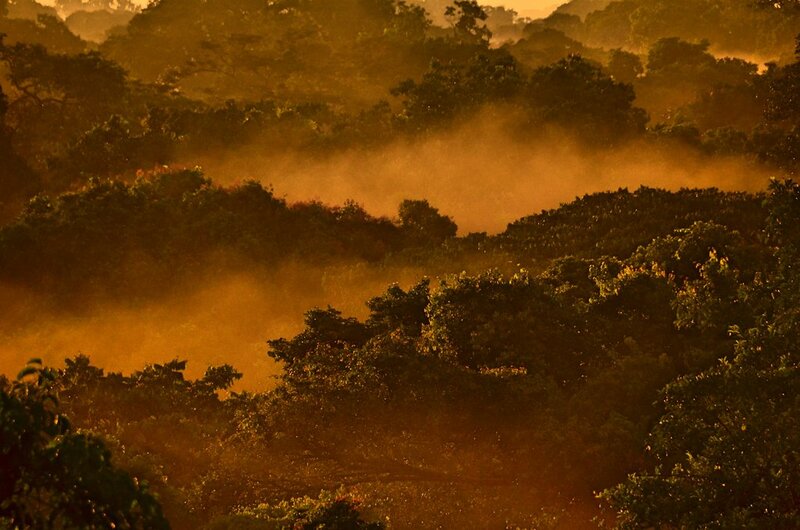 The details of our stopover will depend on the weather and the amount of macaw activity, as the birds don’t visit the clay lick when it is raining. A three-to-five-kilometer hike will lead us to magnificent views of the Tambopata winding its way into the lowlands. The forest on this trail, regenerating on old bamboo forest, is good for Howler Monkey and Dusky Titi Monkey. After dinner, scientists will provide an in-depth look at the biology of macaws, their feeding habits, the theories for clay lick use, their breeding and feeding ecology, population fluctuations and the threats to their conservation. On most clear mornings of the year, dozens of large macaws and hundreds of parrots congregate on this large river bank in a raucous and colorful spectacle which inspired a National Geographic cover story. Discretely located fifty meters from the cliff, we will observe Green-winged, Scarlet and Blue-and-gold Macaws and several species of smaller parrots descend to ingest clay. Outings are at dawn when the lick is most active. This five-kilometer trail covers the prototypical rain forest with immense trees crisscrossed by creeks and ponds. Amongst the figs, ceibas, and shihuahuacos we will look for Squirrel, Brown Capuchin, and Spider Monkeys as well as peccaries. 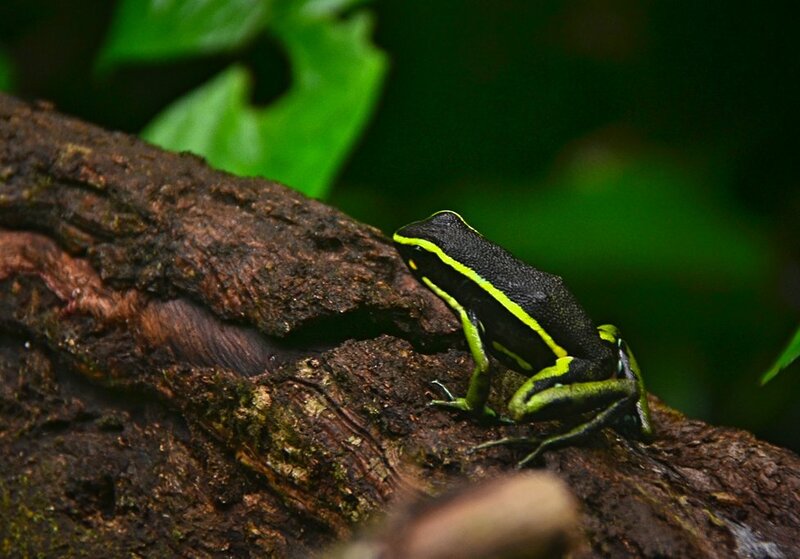 Tambopata Research Center is located within this habitat. Ten minutes upriver from the lodge is a tiny pond with a platform in the middle. It is a great place to spot waterfowl such as Muscovy duck, sunbittern, and hoatzin along with the woodpeckers, oropendolas, flycatchers and parakeets that call this pond their home. An entirely different habitat characterized by smaller, thinner trees atop hills and slopes is covered by this five-kilometer trail. Saddleback tamarins are frequently found here. As we walk near the limits of the swamp we will also keep our eyes open for rare tapir tracks. 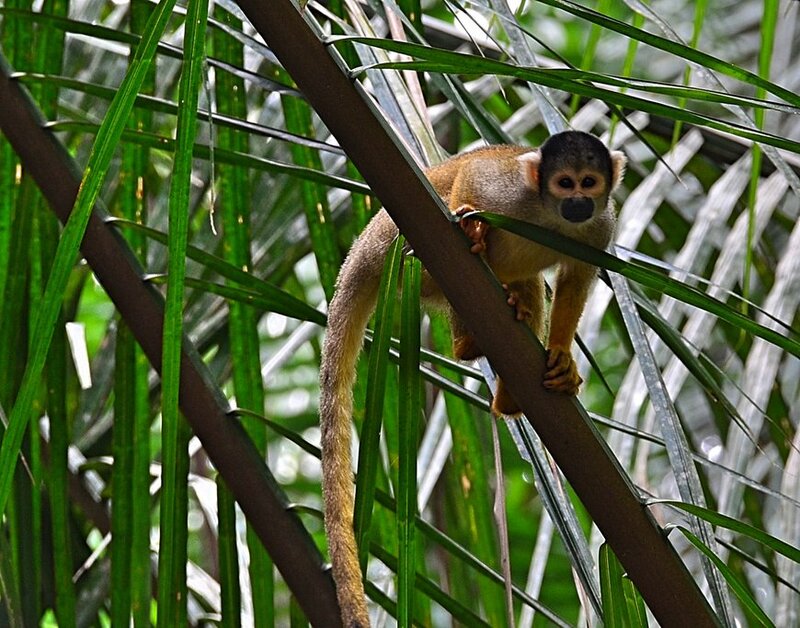 Growing on the remains of an oxbow lake and providing both arboreals as well as terrestrial mammals with fruits throughout the year, the aguaje palms are one of the most important food sources in the rainforest. Demand for these fruits and great conditions for planting rice makes the palm swamp also one of the most threatened habitats. Transfer Puerto Maldonado Headquarters to Airport and back to Cusco. On your first day in Cusco, we´ll embark on a short half day hike to the Inca Fortress of Sacsayhuaman. This will help us acclimatize to the altitude, in preparation for the Classic Inca Trail. Walking around the site to understand the importance of this Fortress to Cusco & its people, we will take our time before moving on for a great picnic. 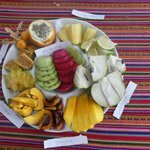 This will feature local food native to the area, which is organic, unique, and not available in other parts of Peru. A really delicious lunch option. In the afternoon you`ll be free to explore the City of Cusco and enjoy all it has to offer, like San Pedro market, the Plaza de Armas, San Blas and much more. Early in the morning, we take the way leading from Cusco to Km 82 (2750 mt/9130 ft), this is our checkpoint at the beginning of the trek. The trail follows the river valley for a while; this is a good training day before the second more challenging day. Along the way, we will pass Wilkaracay with its impressive view of Patallacta which are both important Inca remains. It is just the beginning of a holy trail full of sanctuaries. Today, after about 6 hours walking we will reach our first camping place at Huayllabamba (3000 mt/3840 ft). On reaching our camp for the evening we will be met by our trek team, the porters who will have already set up camp and our cook will be preparing our evening meal. Today, we will follow the Inca trail ascending to Warmiwañuska (“Dead Woman’s Pass”). This is our highest mountain pass (4200 mt/13776 ft). A beautiful stone trail will then show us the way as we descend to our tents in the campsite at Pacaymayo (3580 mt/11740 ft). Approximate Walking time: 8 to 9 hrs. 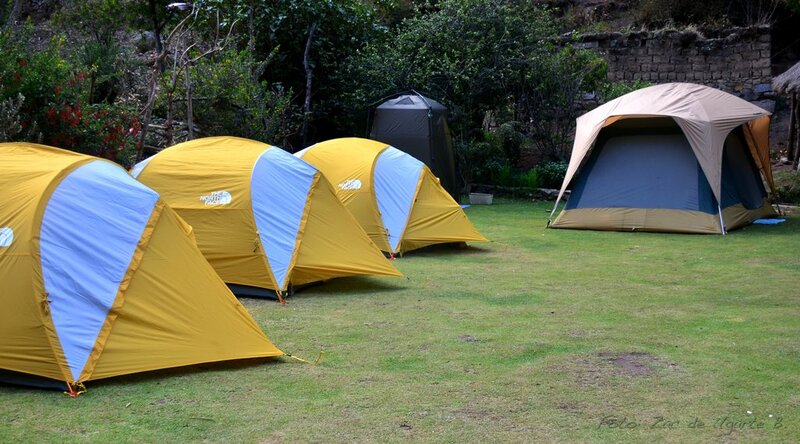 Waking up just in time to be served a hot drink, our tents pitched within the surroundings of the cloud forest. After a good and healthy breakfast, we continue along this ancient trail passing small marshes, continuing over the second mountain pass of the trek. It is the second highest point of the hike (3,900mt/12,950ft). As we descend we will see how the vegetation becomes more abundant. We have lunch at Chaquicocha (3500 mt/11,620 ft) a fine place for a break in the middle of the cloud forest. 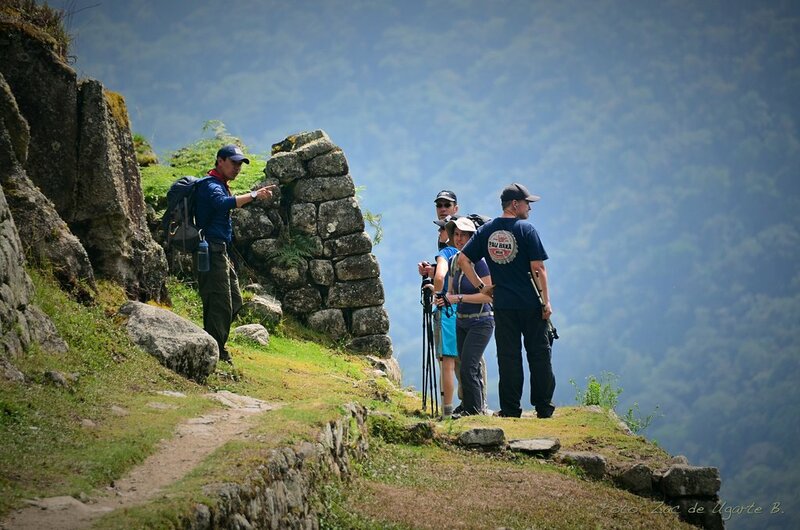 The last two hours of the day, are some of the most memorable and breathtaking scenic views of the Inca Trail. We reach our last campsite when the sun sets at Phuyupatamarca. We begin the final leg of the trek to the lost city of Machupicchu. We descend for 3 hrs, about 900m below from Phuyupatamarca. On the way down there are a couple of Incan Archaeological sites: Intipata first, and then Wiñaywayna which is just 2 hours before the Sungate (“Inti Punku”). Having taken the time to enjoy the first sight of Machu Picchu, we then walk down to the complex for a full tour to understand this amazing and unique Citadel. Later, we take the bus down to be on time for the train back to Ollantaytambo & then from here our private transport will bring us back to Cusco. Approximate Walking time: 5 hrs. We will transport you to Cusco’s airport for your return flight to Lima to make your connection for your onward or homeward journey. Until the next time, we`ll say goodbye! I contacted Steve with KimKim travel after striking out with other agencies who were unable to build an "off the beaten path" adventure to Peru. Steve listed and then executed an amazing itinerary which far exceed our expectations.